Crafting a truly fun arcade game is one of the most delicate balancing acts a game developer can undertake. Build in too many systems and you risk rendering the game complicated and tiresome to play in all but the shortest of stretches. But keep things too simple or hand-hold for too long, and the player begins to wonder why they’re even playing at all. Russian Subway Dogs strikes a happy medium between the two. It gradually adds new elements to keep things interesting, but everything remains accessible because it’s building on a handful of core mechanics. And, quite cleverly, developer Spooky Squid Games taps into two of the internet’s biggest obsessions with the game’s design: adorable doggos and jokes about Mother Russia. An estimated 35,000 stray dogs roam the streets of Moscow on any given day, begging for scraps among the hustle and bustle of one of Russia’s largest cities. Some of the smarter ones began hopping onto the subway for rides, alternating between snoozing and gleaning pets from their fellow commuters, and this tale of cunning and perseverance inspired Spooky Squid Games. “We have done extensive, totally legal research in order to fine-tune this chaotic simulation of what it’s like to scavenge for food from Russian commuters,” the game’s Steam page reads, so you know it’s legit. 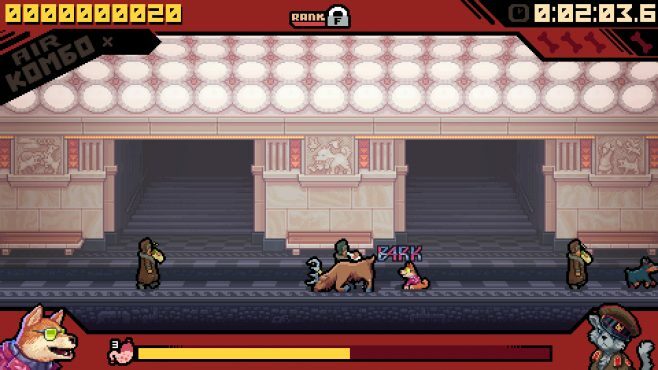 Russian Subway Dogs works as because it only has two controls, jumping and barking, harkening back to classic arcade games with their limited button inputs. As people rush onto the subway platform, your job is to sneak behind them and yelp, scaring them into dropping their delicious morsels so you can gobble them down for points. This fills your stamina meter, which drops over time and when you bark. You’re not alone, you soon find when other stray dogs begin to hog your platform. If you’re not quick enough, a Doberman or yelping poodle will make off with your score. Additionally, some commuters carry vodka or hot sauce, which explode when they hit the ground, injuring you if you’re too close but also cooking food for extra points. And of course, you’ve got to watch out for pesky elks and bears that are known to roam the subways. This is Russia, after all. Where Russian Subway Dogs draws most of its charm is in its stylized visuals. Its menus borrow heavily from the socialist realist art that dominated the Soviet Union during the twentieth century, all sharp angles and bold lines, sticking closely to its iconic red, yellow, and black palette. Gameplay is rendered in adorable pixel art, with each type of commuter featuring a distinct look and behavior. American tourists rock pompadours and gobble down burgers as they make a hasty exit off the platform, forcing you to rush after them first if you want a bite. Wiley babushkas lumber around with no patience for hungry subway dogs, swatting at you with their comically large fish if you get too close. And little girls skip along merrily as they munch on their chocolate bars, a large point boost if you can handle the hit to your stamina and stomach. What ultimately makes Russian Subway Dogs shine among the hundreds of indie games clamoring to become the next arcade hit is its singularity of vision and commitment to its joke. 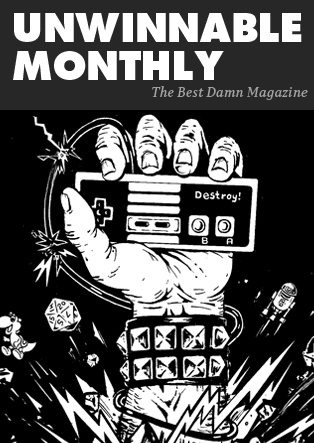 Spooky Squid Games succeeded in preserving the whimsy behind the silly game they originally made in a weekend for a game jam, developing on that foundation without losing sight of what made the game fun to play in the first place. The end result? A game that’s a delight to sink a few hours into after a long day. P.S. : One of the character’s name is Proletaricat. I mean, what more can you ask for? Russian Subway Dogs is available on PC for Itch.io and Steam, with plans for releases on PlayStation 4, Xbox One, and PlayStation Vita later this year.